Open Mind allows teachers and students to enjoy the best combination of digital and print material. This flexible new course combines language development with the crucial skills students need to be effective and adaptable for work and study. Read reviews and testimonials for Open Mind. Open Mind is mapped to Cambridge English, Trinity and TOEIC exams. See the mapping documents and Open Mind placement tests here. Read how Open Mind and its digital components are being used successfully at this language school in England, and see interviews with a teacher and students. Steve has been involved in ELT for over 20 years as a teacher, examiner, trainer and author. His most recent courses are the Mind series and Open Mind. He has also written many other successful courses including Laser for teenagers and Destination. Steve was on the Executive Board of TESOL Greece and presents on different ELT topics and methodology at conferences worldwide. Steve is based in Bolton in the UK. 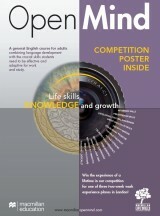 See language and life skills teaching tips from Steve and the other Open Mind authors here. Mickey graduated from the University of Texas and went on to teach there after gaining a Master’s in TEFL. Since then, she has taught in Colombia, Spain, the USA, and Mexico. Mickey has worked as a teacher trainer, a sales rep, an editor, a managing editor, and an academic services manager. As well as Mind series and Open Mind, Mickey has co-authored Style, Skyline, and Attitude, all published by Macmillan. See language and life skills teaching tips from Mickey and the other Open Mind authors here. After completing her Master’s degree in English, Joanne moved to Greece where she started working as an English language teacher. She taught a range of students there, from young learners to adults, specialising in exam-preparation classes. Joanne now focuses on writing classroom materials. Dorothy specialises in writing and editing ELT materials and conducting teacher-training workshops. Her areas of interest are teaching reading and writing, business English, academic English, and testing. See language and life skills teaching tips from Dorothy and the other Open Mind authors here.